It was our first day back at Toddler group today. Next week we're all off to an orchard to enjoy some fresh, juicy apples (weather permitting) so I thought we'd make our own apple trees this week. Paper, glue, toilet roll tubes and a craft punch - surely a winner! 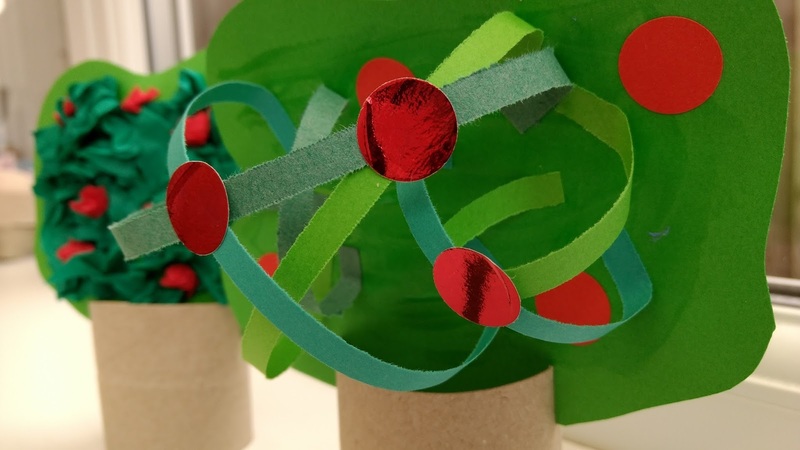 Actually, we were very low on numbers this week as the school's are all on inset so there were only about twelve trees made and at least half of them all went home together - sorry, Karen! 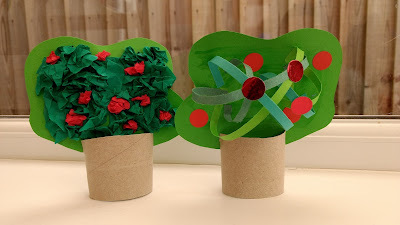 The children did a combination of tissue paper and shredded paper and a few of them also made blackcurrant bushes and blueberry trees using some scrunched up purple tissue paper. I loved them.